Everywhere you look, people say to eat more fish, but it seems with every benefit, there are warnings, such as high mercury levels in tuna and PCBs in farm-raised fish. Considering all of these contradictory messages, how are you supposed to know which fish are okay to consume and which are not? And with half of the world’s seafood now coming from fish farms, how does what you eat impact the environment? To help you answer these questions, Dr. Nandi’s here to tell you everything you need to know about farm-raised versus wild-caught fish. In the United States, fish farms are highly regulated. Both antibiotics and hormones are prohibited, and genetically modified fish are not allowed to be sold as food. In other countries, however, these regulations aren’t as strict. Fish can be given a multitude of chemicals and supplements, and some of these farm-raised fish have an increase in PCBs, potentially carcinogenic pathogens. Foreign fish are also fed a diet of grains and soy mixed with poultry and mammalian byproducts, causing their nutrition levels to plummet. In both the United States and abroad, fish are often injected with pigments that give them a pinkish hue to make them look appetizing. Aquaculture, the process of farming fish, also damages local ecosystems by polluting nearby waters, threatening local flora and fauna. The tanks are often overcrowded, and disease spreads rapidly. Worse, each year, millions of captive, farm-bred fish escape into the oceans and seas, compromising wild fish with diseases and weakening the gene pool by breeding with natives. Fish farms also pollute the ocean floor with leftover food scraps and debris. This rotting food promotes algae growth, which consumes oxygen and poses a threat to the world’s coral reefs. Not everything about farm-raised fish is bad, however. Although the omega-3 fatty acids are depleted in many farm-raised fish, some captive fish, including the Atlantic salmon, have higher levels of omega-3 fatty acids than their wild-caught counterparts. Also, farm-raised fish are less impacted by mercury, making them safer for consumption. Though all of the foregoing information about farm-raised fish may make you believe that wild is the way to go, that isn’t necessarily the case. Swordfish, tuna, sharks, and other large fish that are caught in the wild have high levels of mercury. And since many wild-caught fish tend to be at the top of their food chain, catching them impacts the environment more than farm-raised fish such as tilapia, salmon, carp, and catfish. Also keep in mind that some of the harvesting techniques that companies use to catch these fish hurt the ecosystem and other fish and marine life that get in the way. Ultimately, when it comes to which is best – farm-raised or wild-caught fish – there is no straight answer, but wild-caught fish tend to be the safer bet. If you’re concerned about your diet’s environmental impact or the level of toxins in your food, some species of farm-raised fish may be better than those caught in the wild and vice versa. Be your own health hero and stay on top of issues related to fish farming, harvesting, toxin levels, and more by following Monterey Bay Aquarium’s Seafood Watch Program. 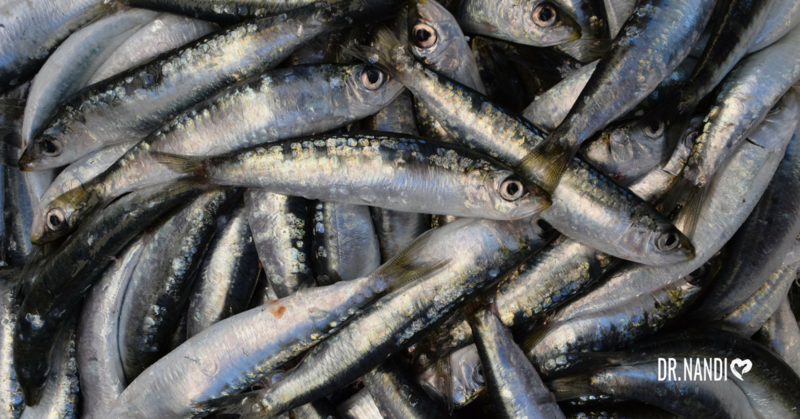 Opting for smaller fish is more sustainable, and they contain less mercury.